CrayPas Junior Artist oil pastels are excellent. This was a pleasant surprise since Sakura makes three grades of oil pastels and I'd already formed a high opinion of the artist grade -- CrayPas Specialist. I thought their children's line would be good for a children's brand, did not expect it would be a decent student brand for adults to use. 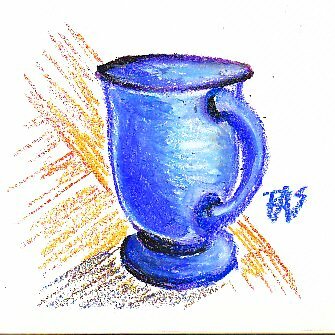 Above is a quick sketch of a blue cup done with CrayPas Junior. Round wrapped sticks are small like the Pentels, about 1/4" wide by 2 3/8" long. I'm sure this is how Sakura manages to economize and put good pigment concentration and opacity into a children's brand. If there are fillers, they don't detract from the brightness and opacity of its hues. 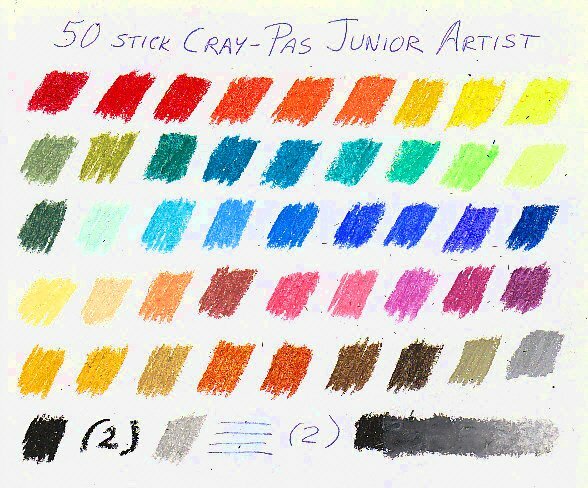 The 50 stick set of CrayPas Junior Artist has two white and two black pastels included. That's a good combination for anyone who may be doing a lot of bold drawings with strong black outlines. I would suggest blending the colors and applying any black outlines last though, as the black is very strong, opaque and blends out into colors easily. There is some crumbling, not as bad as Reeves but not as clean a texture as Pentel. Other than that, these come pretty close to Pentel for handling. I would recommend this brand for artists on a budget. Softness is medium, opacity good, color range is chromatic with many hue variations especially in greenish blues that have similar value. Sakura sidestepped the entire question of color names and numbers, though all sticks prominently carry an AP nontoxic label and CE label. They are made in China for this Japanese company. Packaging, the set comes in a sturdy cardboard box. Be sure to put a rubber band or two around it while carrying in a backpack or school bag, since there's no cardboard sleeve to keep the top from falling off. No styrene trays inside the box, but there are cardboard dividers to keep the sticks neatly in two rows. Lightfastness isn't claimed on the package but the description at Blick Art Materials says "They contain pigments that blend easily and last without fading. Ideal for texture rubbing, blending, scratch art, almost any coloring project." What that means in terms of the Blue Wool scale of lightfastness is yet to be seen. I would predict from that phrasing that CrayPas Junior Artist oil pastels last a lot better than some other children's materials but may not make it all the way into artist grade, or that some colors are 6 or better but many are in the high end of the lower range. It should be interesting to find out in Spring 2010 (or sooner if they do fade rapidly). Softness is medium, reasonably firm and easy to handle. I paid $6.29 for my CrayPas Junior 50 stick set on January 31, 2009, so these are definitely in the Super Bargain price range of oil pastels. A set of 12 was only $1.20 so this is something you could toss in with any other order to see if you like them without feeling much budget pinch. While they don't come in open stock, Sakura also produces a set of 12 "Chubby" ones for little hands, plus you can order either jumbo or regular sticks in big classpacks. Boxes of 12 black or 12 white are also available, $2.32 at time of writing -- a little more than the 12 color box but this could prove very convenient for sketching purposes. One of the classic traditional sketching techniques is to use a mid-value paper with black and white charcoal or Conte crayon. These oil pastels would be a little cleaner if you're doing that sort of sketching on location and I can see some value to the serious artist in picking up the boxes of black and white for that convenience. Chubbies cost a bit more at $6.99 for a set of 12 or $60.77 for the Colorpack with 24 of each color. They may be useful for signmaking or large poster projects as well as little hands that have trouble handling the thin small regular sticks. Another good bargain brand. Sakura has been making oil pastels since 1925 and their experience shows in the quality of these products. Below is a color chart for my 50 stick box. Metallic gold and silver are included on the row above the black, gray and white. I also did a shading bar between black and white to see how well they blend and I was very happy with the results. This looks a lot to me like CrayPas Junior has a floral painter's palette. The chromatic hues stay close to the same values but move steadily around the color wheel, with only a few tints but plenty of brights. Basic earth tones are there along with metallics. 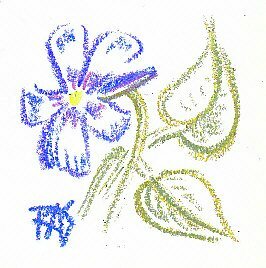 I did a light sketch of a blue flower from imagination on the same page just to show how they look in a light application. CrayPas Junior Artist are excellent sketching oil pastels. I found that working lightly with them was comparatively easy and they were firm enough to control without any trouble. Blending is good but unblended loose applications look fine on a normal-tooth sketchbook paper. This is a good brand for experiments, for fooling around, for quick studies and gesture sketching as well as more developed studies. They thin with oil painting mediums from odorless turpenoid and turpentine to linseed oil or any other fine oils. Some people use baby oil for thinning oil pastels.